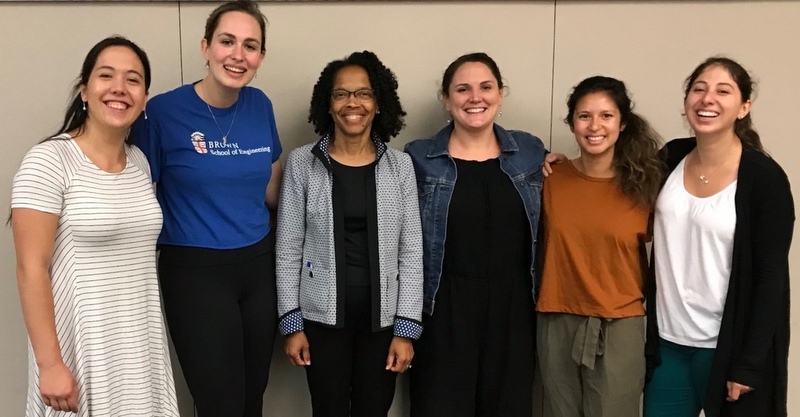 Dean of CCNY's Grove School of Enginnering Gilda Barabino [2nd from left] with members of the Brown University team that placed first in the Biomedical Engineering Society Coulter College training program. Barabino and the Grove School crafted the national program held in Minnesota this year. As the home of New York City’s only Master’s in Translational Medicine (MTM) program, City College’s Grove School of Engineering is a leader in teaching a diverse student population new medical technology. At the 2018 BMES Coulter College – a highly selective summer training program focusing on translation of biomedical innovations -- the school incorporated its rigorous standards into the event for top national students. Gilda A. Barabino, dean of the Grove School, and Jeffrey S. Garanich, who directs its MTM program, led this year’s Coulter College for 48 students and 12 faculty advisors in Minneapolis, Minnesota. Matthew Walker, associate professor of biomedical engineering, Vanderbilt University, was co-lead. The four-day event hosted by medical device company Medtronic focused on the design of new medical technologies, with emphasis on health disparities and resource-constrained design. “Clinical, design, and business advisors guided student teams through a highly dynamic process designed to help them better understand how to develop solutions that address unmet clinical needs,” said Barabino, who delivered the opening remarks. The student teams presented their designs and final projects in a venture capital pitch competition. Brown University’s four-member team took first place with their concept “ComPaDre,” a solution to communication barriers between doctors and non-English speaking patients. The winners will make another presentation at the Health Care Disparities symposium at the 2018 Biomedical Engineering Society annual meeting in Atlanta on Oct. 19. Barabino will chair that event, too. BMES Coulter College is a training program focused on translation of biomedical innovations. Mentors in key design areas guide student teams through a highly dynamic process designed to help them better understand how innovations can meet clinical needs, while providing tools and approaches used to develop novel solutions for identified clinical problems. The program is supported by funding from the Wallace H. Coulter Foundation.